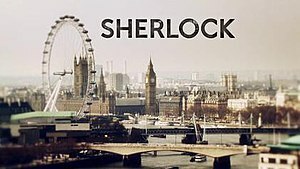 I was holding out hope that BBC America would show Sherlock on January 1, 2013. That hope has indeed been crushed. Fortunately, I hadn’t planned an elaborate watch party or anything…okay, fine, I hadn’t bought anything for the elaborate watch party. It wasn’t going to be quite as elaborate as my Doctor Who 50th Anniversary party, but it was going to be pretty stinking cool. A traditional English tea was planned, I was even busting out a tea set my Grandmother gave me for the occasion. Tea, cucumber sandwiches, maybe some ham sandwiches if anyone just disliked cucumber, cupcakes…maybe sausage rolls were to be consumed. There may have been a bit of decorating planned too…wax pencil on the windows reading “Get Sherlock”, Moriarty was Real and I Believe in Sherlock posters were to be printed (from my home printer), and I was even thinking of crowns for the Moriarty fans…I may reschedule, but maybe not. Sunday, January 19th isn’t exactly convenient for many of my Sherlock addicted friends. So what happened? Yesterday, I decided to go on to my DVR to schedule Sherlock to record on January 1st…just in case I forgot. (Yeah, because that was likely.) I already knew the American release date was January 19th, but BBC America has been so wonderful about simulcasting Doctor Who…Why not do the same with Sherlock? (No, that’s an actual question…BBC, please feel free to answer.) For all of two minutes, I considered boycotting all BBC programming…well, except Doctor Who and Sherlock. Then I realized that wasn’t going to work. Seriously though, I feel like I’m being punished for being an American fan. I’m disappointed in the network and anyone else who had a say in this decision. Do they not realize that the internet has made this a global community? The actors and creators know this, because they’ve commented on the fanfiction, fandom, popularity, etc…Do I blame Mark Gatiss and Steven Moffat? Did they have a say in this decision? Then yes, if not, no. Frankly, after watching the below video, I believe they’re so looking forward to the fans watching this play out for themselves that I doubt they got a say in this debacle…yes, debacle. I know there are ways to get around this with streaming video and downloads, but why should I have to buck the system to watch a television show on the same day it gets aired in Britain? I searched the guide for “Sherlock” (you know using the little magnifying glass thing) and my show didn’t come up as a listing…at all. My heart started beating a bit faster, and maybe my palms got a little damp, because how could it not be on at all? A heavily anticipated return after what felt like a hiatus that lasted a century? How could the airwaves not be filled with promotional material for this? Now, I am not a PBS watcher, typically, so the fluttering, panicky feeling didn’t abate until I looked at Masterpiece Mystery and found “Sherlock II: A Scandal in Belgravia” listed. No picture of Sherlock or John, no listing of the actors, just the title and a nondescript description. If they could have revealed less about the show or episode in a description…actually, I’m not sure how they would manage it. I set it to record, because I need to be absolutely certain that this is my Sherlock before January 19th. BBC, do you not want to grow your fan base? Do you not want us spending our money on licensed merchandise, etc? Messing with one of the most dedicated fandoms out there is not the best way to go about this. We’re creative…and possibly vindictive. What do you think? Also, about those alternatives…I have today and tomorrow to search the internet for solutions, because, so help me, if someone tells me, writes to me, posts a spoilery thing hidden in an innocuous…something before I get to see this all unfold for myself, I will not be held responsible for my actions. Therefore, I will be scheduling some pre-written blog posts and banning myself from social media until I can be sure that I won’t have to take adverse action against anyone. Since the internet was safe today, I did check it out, I’m not the only one to feel this way. This entry was posted on Monday, December 30th, 2013 at 4:02 pm	and tagged with BBC, Benedict Cumberbatch, January 19th, Mark Gatiss, Martin Freeman, PBS, Sherlock, Steven Moffat, United States and posted in Television, Video. You can follow any responses to this entry through the RSS 2.0 feed. « On the First Day of the New Year the BBC Gave to Me….Sherlock! Sherlock doesn’t air on BBC America it airs on PBS Masterpeice so the BBC isn’t to blame for it not been shown like Doctor Who. Also if you have Google Chrome you can always download Hola and use it to unblock BBC iplayer. Its to do with what network commissions it and PBS have the rights to Sherlock so you can only see it on that channel. Hartswood films co-produced it with Masterpiece. I see. I makes so much more sense now. Thanks! Thanks to Victoria for her input 🙂 And thanks for this post. You know I’m with ya!! I live in China and this was my solution for not being able to watch Sherlock on Jan 1st. Download a google app onto your computer called hola! It unblocks all website, including BBC iplayer. I watched the new episode today. You won’t regret it!